TheBigMovieHouse.com is giving away one of two dvds to two lucky winners. 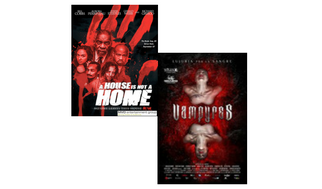 The dvds in question are A House Is Not A Home, starring Bill Cobbs and Richard Grieco and Vampyres, the remake of the 1974 classic. The first thing that you have to do is Fill This Form Out. You also have to like us on Facebook. That's it. The winners will be announced on on November 13th. CONTEST DISCLAIMER: You must enter by November 12th to qualify. U.S. residents only please. We sincerely apologize to our non-U.S. visitors. Winners must respond with their mailing address within 48 hours, otherwise you will automatically be disqualified. No exceptions. Contest is subject to change without notice.